If you're reading this, I imagine you may be looking for ways to tie up your holiday party loose ends. Or, maybe you're searching for tips on boosting your Christmas dinner table to that next level. Or, maybe the title of this post caught your eye out of curiosity. If you're nodding your head "yes"...well, you've come to the perfect place, my friend :) Today, I want to give you 5 tips on how to take grocery store flowers to the next level. If you don't have much experience with using fresh flowers, it may seem a little daunting at first. But I'm here to help make this easier for you and maybe you'll even have a little fun! Now, if you're already wondering, "Morgan, what in the heck is a focal flower?!" Don't worry. It's easier to spot than you may think! Look for flowers that are fairly large in size and will really stand out in your table arrangement. 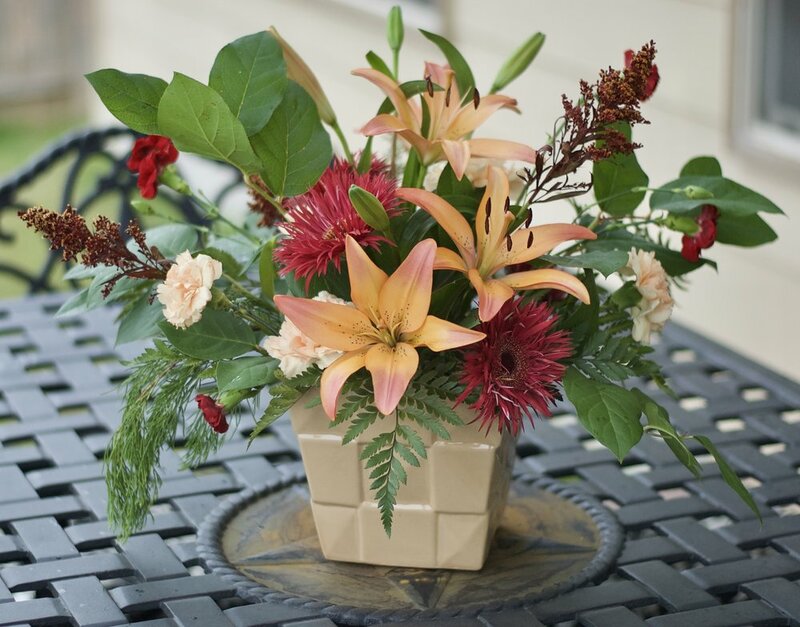 For example, the focal flowers I used here are some peachy orange Asiatic Lilies (see photos below). They're not too expensive and you can usually find them sold with several stems bundled together. It's ok if there are a few unopened buds on the stems. This only adds interest and new blooms will gradually open throughout the life of the arrangement. Let's start with color contrast. 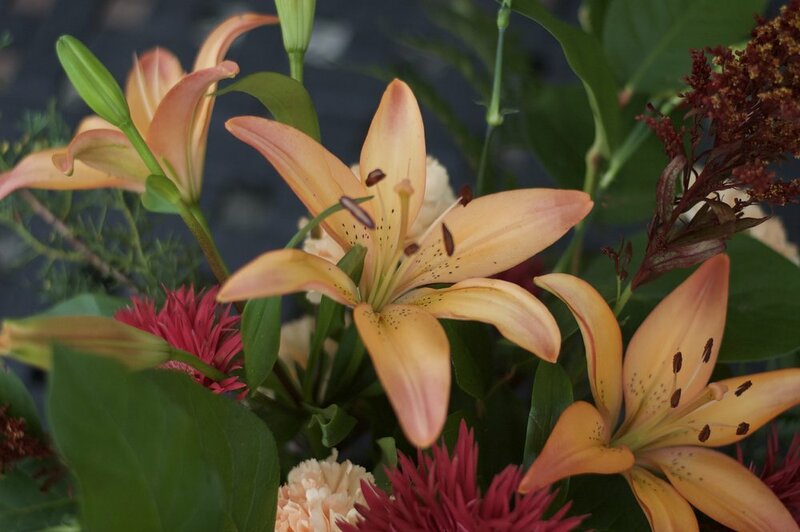 If you look closely at the photos below, you will notice that the lilies are mostly peach but have a hint of that darker burgundy color on the edges of the petals. You can also find this color on the anthers of the stamen (if you forgot everything you learned about plants and flowers in science class...those are skinny, pointy things bursting out from the center of the flower). Lastly, these lilies have little freckles on the inside of their petals that also match the burgundy color I mentioned earlier. Shapes and sizes. The keyword here is going to be variety. Look for medium sized flowers and smaller flowers that have different shapes too. This will add interest and captivate the viewer. If you're still reading, I'm glad because this is my favorite part of designing! If you can find something with a cool texture or an ingredient that is unexpected or out-of-the box, this will definitely bring your arrangement to that next level we talked about in the beginning! In my arrangement today, I used some burgundy solidago. (those are the taller, textural stems on top) And if you look very closely, you can tell that these flowers have both the burgundy shade and little, tiny hints of that peachy gold color found in the lilies and standard carnations. So in this case, the solidago actually has a dual purpose- it provides a textural element as well as a color blending agent. Some other ideas for adding texture are using any type of berry (hypericum berries are commonly displayed at grocery stores and come in red, green and peach). Curly willow is also one of my favorite unexpected elements to use and it kind of looks like a curvy stick! In the flower world, green acts as a neutral color. I would recommend adding 3-5 types of greenery as your first step when arranging. Greenery helps to define the shape of the arrangement and also aids in creating little "pockets" where your flowers will be placed. If you have any hedges or even small tree branches with green leaves, you can clip those from your own backyard and it won't cost you a dime! It's ok if you don't have many plants in your home's landscaping. Most grocery stores will sell bundles of mixed greenery for only a few bucks! - try to work in odd numbers. For example: 3 focal flowers, 5 filler flowers, 3-5 types of greenery, etc. - keep it balanced! Try to balance out where you use each color. Make it look like a good mix of light and dark colors. And don't forget to tie it all together using those "blending" colors! Well, that's about all I have for you today. Thank you for taking the time to read through my tips. Don't forget to scroll down to view photos of each type of ingredient I explained earlier! If you get stuck or have any questions, please feel free to leave a comment below or send me a quick email. Happy arranging!